Most primary production sectors have faced a wet winter and early spring. However, this weather has also set up a potentially excellent growing season as the sun comes out and the temperature rises. For horticulturists, almost entirely across both islands, planting was held back, slowing the establishment of crops, including vegetables. Growers setting up strawberries, especially around West Auckland, suffered similar delays. Preparation for planting and sowing was hampered, though mild conditions advanced the season up to two weeks in some areas compared to the same period over the past couple of years. Access to land to undertake some of the development that goes on around apples and grapes, and would typically be done during the winter and early spring, was also held back by inclement conditions. Those weather challenges are offset by continuing positive export prospects, as markets are eager to take New Zealand horticulture produce, particularly apples and kiwifruit. Apple prices have generally held up, assisted by Northern Hemisphere orchards suffering from frost, which assisted the sale of New Zealand apples. Fruit selling well into the flourishing Asian markets is another factor in the positivity apple growers are currently enjoying. Livestock markets suggest farmers in most sectors and regions are facing the season ahead with quiet confidence. Sales of lamb and sheep meat have been strong, showing significant improvement on 2016, at over $1 per kilogram ahead of where they were last winter. These values appear sustainable, as the outlook for sheep looks bright. International markets have picked up. There is more activity into China, where excellent demand for mutton is evident. In addition, some mutton is now being further processed before shipping. These added value products have helped improve farm gate returns. Lambing this year has generally been good throughout the country. Drops have been above average, which, coupled with favourable weather conditions, has resulted in pleasing survival rates. 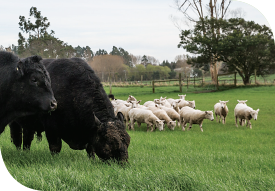 With so much stock quit by South Island farmers during the last three years due to drought, especially in North Canterbury, as this year’s spring shaped as markedly better, farmers sought to replenish depleted capital stock. A limited quantity of stock was available through most of the winter, and sold well. Indications of strong demand for all sheep meats in overseas markets bode well for the coming season. In particular, increased market activity into China, where excellent demand for mutton is evident, sends positive signals. Some mutton is now being further processed before shipping, and these added value products have helped improve farm gate returns. Trade and climatic conditions for cattle farmers are generally positive, though with paddocks being so wet, the feed supply has tightened, meaning farmers have largely depleted the feed surpluses our mild autumn created. Although local market demand is strong and prices remain positive, downward pressure from overseas markets mean cattle values are unlikely to rise significantly through the spring. In general calving has gone well for most dairy farmers, albeit with challenges from the persistent wet weather. Many dairy farmers have seized opportunities presented by the beef industry. Producing four-day-old calves and taking them through to 100 kilograms presents an excellent entry point for those diversifying into beef, which will influence decisions for dairy farmers ahead of mating. Export returns indicate the value of some classes is set to significantly exceed last season. Farmers have been thinking about continuing this cycle next season, and taking advantage of the excellent returns indicated for beef. Utilising well selected beef bulls over a dairy herd can deliver many benefits, including increased profit and production. Using quality recorded, high genetic merit Angus and Hereford bulls, instead of unrecorded, inferior bulls, is an option that many farmers are considering. Demand for fine wool is positive news, while there may even be some signs of optimism for strong wool growers. Driven by increased sales of leisure and outdoor wear, some fine growers are electing to lock into contracts at elevated prices, which could be at the top of the range through the next few seasons. Although prospects for strong wool continued to drop through the winter, they reached a relatively steady point in early August as exporters who travelled to engage with overseas customers brought back orders from Europe, the United Kingdom and Japan, balancing the limited support provided to New Zealand growers from China during the preceding period. Poor weather raises the prospect of mud and vegetable matter being picked up on wool, which unless dealt with thoroughly in the woolshed, risks discounting prices. When strong wool stock levels are high, as they have been for some time, prices are down and exporters have the luxury of being selective with their purchases. In these instances, farmers who do not take care with their wool preparation are unnecessarily putting themselves at additional financial risk. Pre-lamb fine wool kept South Island shearers, stores and processors busy, with attention to wool preparation again key. Winter storage of strong wool was a logistic challenge, with some stores going back to block stacking, which allows for higher stacks, though is more time consuming to process. Although the strong wool market appears to be approaching a floor in the price, due to the amount of unsold wool in New Zealand and the United Kingdom, and the lack of sales into China, prices seem set to remain at the bottom of the range over the next few months, and perhaps longer. At the beginning of spring early shorn hoggets’ and lamb’s wool with a micron of 34 and finer found much improved levels.